My favorite distance is the half marathon. I like that I can run a comfortably hard pace and get a good workout in while being able to recover within a few days. I have good days and bad days when I am in a training cycle for a marathon. I would say that in the last couple of years I have struggled at times with burnout. Some days I don’t feel like running but I usually push myself through and feel better once I get my workout in. I do not rotate shoes. I wear Mizuno Wave Sky for training and longer races, and Mizuno Sayonara for shorter races. I am a big fan of the comfort and support of Mizuno shoes. I do not. When I am starting to feel the discomfort of a training run or race, I try to zone out and relax my shoulders and keep moving. I sometimes break runs into segments so as to help get me through. I feel this intermittently throughout the training cycle. 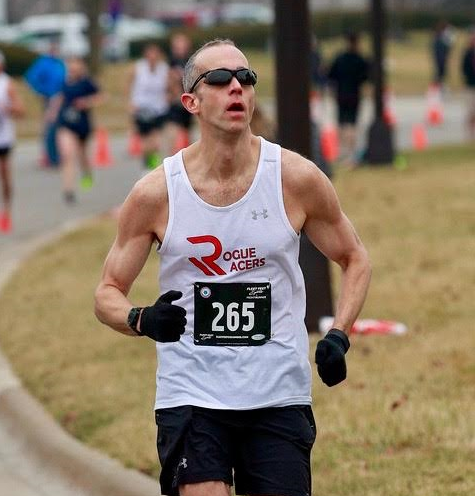 I’ve been competing in running events since I was a kid, and at times I think to myself: “Been there, done that,” and what is the point of continuing to put my body through the rigors of training. Running a marathon was once a bucket list item that triggered my OCD competitive nature, and so now I am pretty hooked on it. Running has boosted my self-esteem from a young age and helped to give me more energy and vitality in my day to day life. It has taught me lessons about teamwork, commitment, success, failure, and overall wellness. I have really enjoyed the great friendships that have developed due to running and the excitement of helping to form Rogue Racers. My favorite marathon is by far the Boston Marathon due to the tradition and the excitement of the crowd coupled with the work that it took to finally qualify. From a scenery perspective, Big Sur was the most beautiful marathon that I have ever done; the piano player on Bixby Creek Bridge will always stand out as a fun memory. I’ve been running since I was a kid playing soccer along with running Track & Field in Elementary school, Middle School, and College. I was a sprinter who ran the 100M, 200M, 4x100M Relay, and the Long Jump. I also did the 110 Hurdles in Middle School. I loved sprinting because you had to give 100% percent effort each time and I was decent at it. I got into marathon running in 2009 as a bucket list idea when my wife suggested that I give her running group a try. (Marathoners in Training, MIT). I have been hooked on distance running ever since. What is your favorite running workout? I like tempo runs because they are great training preparation for marathons and they are comfortably hard. Boston 2018. I suffered a quad injury during the first half of the race and with the wind, rain, and cold, I ended up in the Medical Tent being treated for Hypothermia. I can honestly say that it was a miserable experience. I will never complain about hot weather again. I would like to do the New York City Marathon someday. I used to run with an iPod but I don’t run with music anymore and I actually like it better. Running outside is a form of Zen for me in that I can clear my mind from the daily duties and soak up the sights and sounds of nature. I find running without music to be a lot more peaceful.